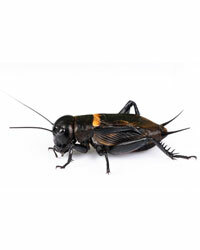 Black crickets (Gryllus bimaculatus) are a hardy, cold tolerant cricket and grow to over 30mm in length. Six sizes are sold, and are packed in tubs and bulk. Black crickets are sold as hatchlings (3mm), firsts (5mm), seconds (6-8mm), thirds (8-10mm), fourths (12-18mm), standards (18-25mm) and large (25-30mm). They are a good species of cricket for customers receiving orders by courier or Royal Mail in winter, as they can tolerate lower temperatures than the 2 brown species of cricket. As with any insect, proper supplementation should be given prior to feeding to your reptile. Quick delivery, great communication, insects very well packaged.